It's the first day of March! My Easter beagles are making their annual appearance, so the countdown to spring has begun...which means baseball season is just around the corner. I'm ready. 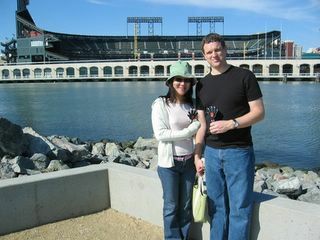 Dan and I posing by McCovey Cove at Giants Fan Fest last month...the ballpark looks so empty!